Note that your Advanced Search page will look different based on your institutions holdings, and the page will also change based on the page you came from. Use the filters in the left column (#1 in image) to change Disciplines/Communities. Over on the far right (#2) note that there are many Select terms pick lists that allow users to see terms used. 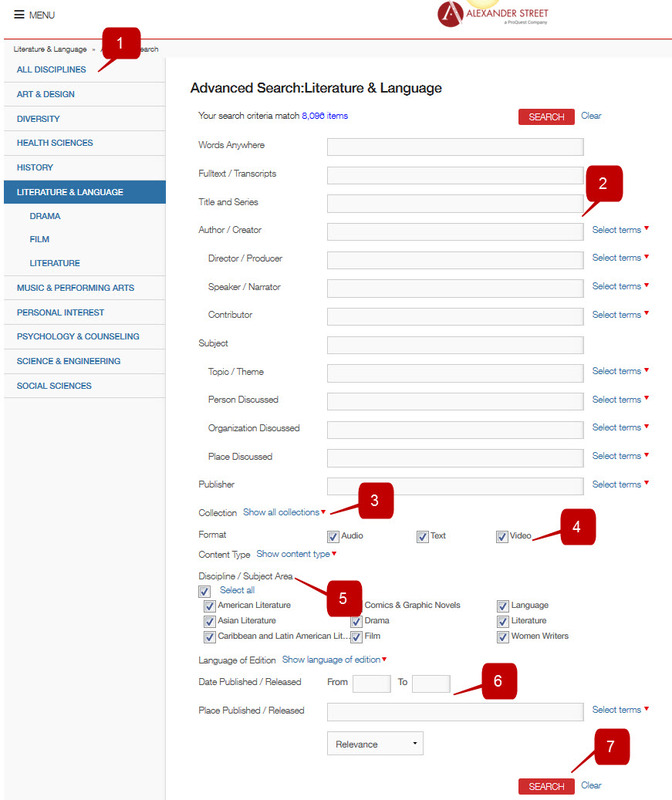 Underneath the various search boxes (#3) is a Collections link that allows you to toggle to see the Collections selected on this form. (Remember: Collections shown will vary based on the page you were just on, and your institutional holdings). Below the Collections link are the check boxes that allow users to select the required Format (#4): Audio, Text, or Video. In the row directly under Format is the toggle for content type. Content types include: book, chapter, cover, news reel, and more. What users see for Discipline/Subject Area (#5) will depend on the page they were just on. Using Literature & Language for this example, the subgroupings shows are based on that discipline. Select or deselect as needed. Finally there is a toggle for Language of Edition (click to see the language list), followed by Date Published/Released (#6), and Place Published/Released (this later option has a pick list). Directly above the Search button (#7) is a pulldown to allow users to select the results order: by relevance, title, news first, or oldest first.